Racing Across the Field | Irene Abdou Photography, LLC - Travel. Lifestyle. Documentary. NGOs, Development & Public Health. 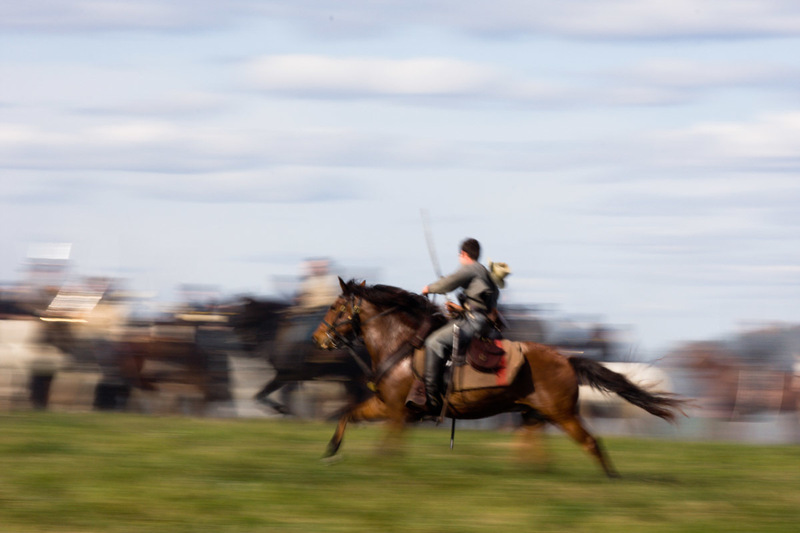 A Civil War Battle Renactor races his horse across the field at the renactment of the Battle of Berryville. The Battle of Berryville took place 1/2 mile east of Berryville, Virginia on September 3-4, 1864 between Federal soldiers led by General Sheridan and Confederate soldiers led by General Kershaw. Leading 2400 soldiers, the Federals were strongly outnumbered, pitted against General Kershaw's division of 3,500. Federal casualties were more than double Confederate casualties. This annual Civil War Battle Renactment took place on the Cedar Creek Battlefield in Middletown, Virginia on October 18, 2008.